With the ever expanding requirements for production companies working on features and series television, an understanding of the workflow requirements for backup, playback, sharing and storing files from all the new 4, 6, and 8 K high-resolution cameras is of utmost importance. The conventional methods of working with, and managing this data will now need to change dramatically due the fact that no longer can a DIT/Data Wrangler working onset/near-set manage to keep up with the workload simply by utilizing a powerful laptop or workstation connected to standalone and or raided drives. To solve this urgent problem, QOS is offering a cost effective solution to survive the demands of multiple high-res camera cards from one or more 4-8K cameras that create massive, RAW, dense camera files. This new technology can rapidly backup these files to multiple high-speed raided drives using QOS Server technology that is built on powerful CPUs, GPUs, RAM, SSDs and network connections to run a secure and efficient production. Building on the current QOS Server, (Speedy, Stable, Shook-Absorbent, Sharable, SAN Server) QOS Server, LLC is releasing their next generation of “Quantified Overdrive Shared Storage” built into the “Filmmaker” Product-line which is specially designed for the M&E, Computer Design, VR and Gaming industries. The approach is simple: provide a unified high throughput software and hardware designed production platform that solves the challenges of onset data camera offloads, a high-speed method of transporting the data to editorial, a dynamic editorial solution for Avid and Adobe, and a powerful solution for transcoding, encoding and shared storage for low and high resolution film postproduction that can also be easily connected to the cloud. 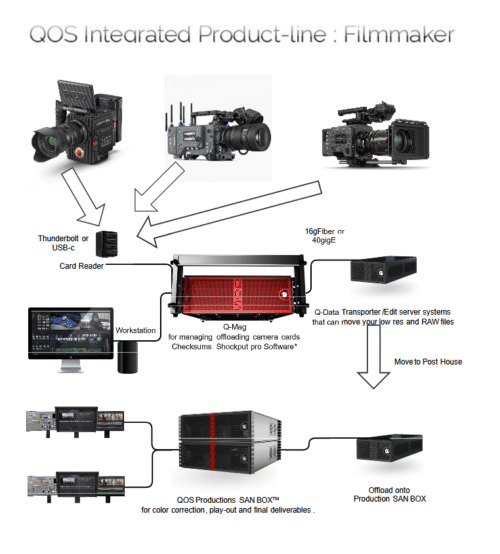 The “Filmmaker” includes Q-Mag for managing offloading camera cards to multiple backup high-speed servers and onset screening including Check-sum, transcoding options. Additionally, the high-speed Q-Data Transporter server systems can move your low res and RAW files to a production facility with the ability to rapidly offload the files to a fully capable 4-8K QOS Productions SAN Box™ that can serve out low res-files for AVID and Adobe editorial, as well as provide for transcoding, encoding and shared storage for all the high resolution RAW files requiring color correction as well as play-out with the added ability to undertake final deliverables. This is a North American made, “Green” complete workflow designed for professionals who are working in these creative fields who only have seconds and minutes to transfer, copy, playback and store these types of files. The cost of purchasing and or renting any of the new 4-8K cameras and basic accessories per week is equivalent to the cost of purchasing or renting the complete a high res camera is equal “Filmmaking” technology (per week) to produce content for production companies and studios. The savings to the producers is substantial considering that the entire “shoot-to-screen” can be pre-budgeted for, and no longer are there cost overruns for the number of camera data cards, cost for overtime for data transfer and data backup. Costs for editorial are lowered, especially the cost of transcoding, encoding, shared storage and delivery of the final project. Due to the speed and control of the complete data workflow the production can keep overtime as well as additional data services under-control with the added benefit of being able to schedule all production work including deliverable around the needs and requirements of the production. Objectives: more creativity and higher quality production values with less stress and less overtime, thus resulting in fewer cost overruns. QOS Productions SAN BOX™ for color correction, play-out and final deliverables.